HARARE, Zimbabwe (CNN) -- More than 3,000 people have died of cholera in Zimbabwe, according to World Health Organization figures released Wednesday, seeming to confirm health experts' concerns that the disease is not yet under control. 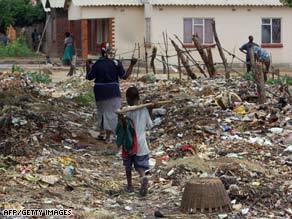 Zimbabweans walk through mounds of garbage. Lack of sanitation and clean water make cholera spread. The Geneva, Switzerland-based organization's statistics show that 3,028 lives have been claimed by the water-borne disease, out of the 57,702 people that have been infected since the outbreak of the bacterial illness in August last year. The epidemic has swept through a country wracked with political and economic crises. It has also coincided with a nearly five-month-long strike by doctors and nurses who are demanding salaries in foreign currency. Cholera is an intestinal disease caused by bacteria in contaminated water. The epidemic has been aggravated by erratic water supplies, shortages of water purification chemicals, broken water and sewer pipes and uncollected garbage from a waste-disposal system that has collapsed. Children can be seen playing on heaps of uncollected garbage in the suburbs of most urban areas in Zimbabwe. In early December, President Robert Mugabe's government declared the cholera epidemic a national emergency, paving the way for aid from international groups such as Oxfam, Doctors Without Borders, W.H.O., the U.N. Children's Fund and USAID. But that assistance has not yet improved the situation, and the disease has spread to new areas since then. "The problem in Zimbabwe is that the infrastructure is obsolete, especially when it comes to water sanitation. People are going for months without tap water in towns," said Peter Hinn, the director of a German group called Welt Hunger Hilfe (World Hunger Help), which is helping to fight cholera in Zimbabwe. "In rural areas, 60 to 70 percent of boreholes (wells) are not working. So the international community might have come in but they have to address this infrastructure." Zimbabwe was already suffering an enormous economic crisis, with a hyperinflationary economy and shortages of all essentials including food, fuel, cash, foreign currency and electricity. The country's rainy season peaks in January or February and ends in late March, and Zimbabwean Health Minister David Parirenyatwa warned the epidemic could get worse during that time as runoff from the rains spreads the bacteria to other rivers, streams and wells. Mugabe declared in mid-December that the cholera epidemic had slowed, but health experts differed with him and the latest figures seem to contradict his statement.